Revivifying what are only recent memories of massacres by the state during the apartheid era, the Marikana massacre occurred on 16th August 2012, when policemen shot down 112 striking mineworkers, killing 34. Resistance by the ANC and the press to label the incident a massacre (‘Marikana shootings’ was the preferred terminology) at once exposed the easy analogy between Marikana and previous mass shootings at Sharpeville or Soweto, the fraughtness of South Africa’s difficult reckoning with its past, and how violence and the covering up of violence remains an intrinsic part of South Africa’s political structures and institutions. Luke Sinwell, co-author of The Spirit of Marikana – a fascinating recent history of post-Apartheid South Africa, emphasising the crucial role of workers in changing history – has written here about the fight for justice by the workers that survived the massacre and the prosecution of 72 police for their role in the events. The recent decision taken by the Independent Police Investigative Directorate (IPID) to prosecute 72 police for their role in the events related to South Africa’s Marikana massacre is welcome, but it may obscure the truth that the African National Congress (ANC) government pulled the trigger. The Sprit of Marikana: The Rise of Insurgent Trade Unionism tells the story of the agency of those workers who survived it. On 16 August 2012, 34 black mineworkers were gunned down by the police in Marikana, a platinum mining community which is a two hour drive to the Northwest of Johannesburg. No police were killed or injured on the day and hence the event has been called a massacre. Judge Ian Farlam was tasked by the African National Congress (ANC) President Jacob Zuma to chair and subsequently provide the main findings and recommendations regarding the killings in Marikana which took place. The Marikana Commission of Inquiry then sat for 300 days. By the end of June 2015, nearly three years after the historic killings, a final report was submitted by Farlam. This report however was at best watered-down and failed to connect the dots regarding the chain reaction of government intervention which started from the top (through deputy President of the ANC Cyril Ramaphosa) and eventually led to an excessively forceful attack on thousands of striking mineworkers including the deployment of 782 policemen in Marikana, some of which were equipped with R5 rifles each capable of shooting 600 rounds of live ammunition per minute. In evaluating the official evidence and findings, one is also struck by a certain liberal persuasion which infects the language of Farlam’s report, preventing him from seeing the evidence presented at the commission through the eyes of mineworkers. Mineworkers are, throughout the report, homogenized into a mob intent on using violence, intimidation and killing as their main tactics of mobilization. While one cannot deny the existence of these tactics amongst what appears to be a minority of mineworkers, it is clear that this is a gross oversimplification given that, as the evidence indicates, the vast majority of mineworkers acted peacefully and simply sought to negotiate with those authorities who they came in contact with. In this context, the IPID’s recent decision to prosecute 72 police for their role in killing the mineworkers is certainly welcome, but it does not get to the root cause of the killings. By now, I think most of those who look into what happened in Marikana will conclude that 16 August was no accident. It was a premeditated attempt to destroy the independent working class organization which was fermenting at Lonmin platinum mine in Marikana. At the commission of Inquiry, Ramaphosa claimed that ‘we are all to blame’. His testimony has unfortunately exemplified the government’s approach to dealing with killings at Marikana. As time passes this looks less and less like a diplomatic explanation that can reasonably be taken at face value and more like a malign attempt to over up the truth. From day one workers have known that truth. As the symbolic meaning of Marikana becomes sharpened and engrained in ordinary people’s minds, the idea that it was an unfortunate tragedy will become a thing of the past. What we need now is education campaigns as well as mass mobilisation in order to ensure that those who were responsible for the killings, are prosecuted and the justice for the mineworkers and their families is met. Thirty-four mineworkers were massacred in Marikana, but that did not stop the determination of the mineworkers to remain united. 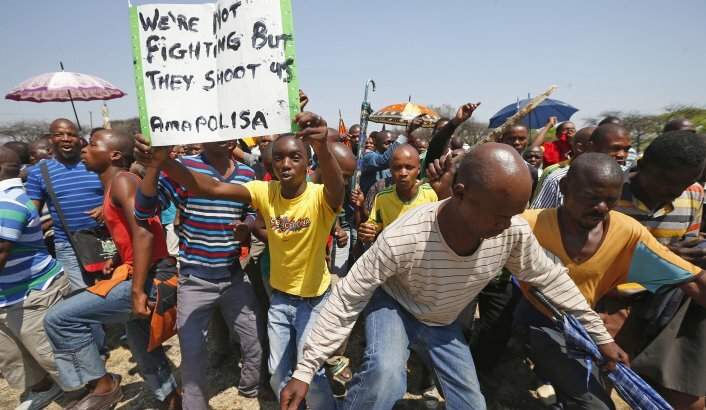 Indeed, the infamous demand for R12,500 per month (equivalent to approximately $1000 per month and which workers were demanding from their employer when they were massacred), originated as a reasonable and hopeful request by Rock Drill Operators (RDOs) who undertake unbearable work, in extremely dangerous and scorching hot environment, only to arrive back in their homes in their corrugated iron shacks to await another tough day of work. My book tells the story of the micro-processes through which mineworkers organized in order to emerge victorious despite the most extreme forms of state violence against civilians in the post-apartheid period. It brings the story to life through in-depth interviews with strike leaders who survived to tell their story. To them the industrial action at Marikana and its surrounding areas the strikes were literally a matter of life and death. Many of the workers that I and my research team engaged with continue to vow that they would die, if not to realize their demand for a living wage, then for the rights of workers more generally. We have experienced Marikana and the platinum belt strike wave a step removed from these realities. Nevertheless we believe we have been closer to the action, both in physical proximity and in spirit, than virtually anyone else known to us who has done (or is likely to do) extensive research on this topic. The Spirit of Marikana is a detailed ethnography story of the micro-politics of resistance that began prior to the massacre at Marikana and culminated in 2014 in the longest strike in South African mining history. It provides a classic example of how seemingly ordinary workers developed a critique of the hegemonic discourse of their employers, formed a counter-discourse based upon their lived experiences, and then undertook a series of actions in order to transform their reality and – unintentionally at first – the political face of South Africa. Luke Sinwell is a Senior Researcher at the University of Johannesburg. He is co-author Marikana: A View from the Mountain and a Case to Answer (Jacana, 2013) and co-editor of Contesting Transformation: Popular Resistance in Twenty-First-Century South Africa (Pluto, 2014). He is the General Secretary of the South African Sociological Association (SASA). The Spirit of Marikana: The Rise of Insurgent Trade Unionism in South Africa by Luke Sinwell and Siphiwe Mbatha is available from Pluto Press.